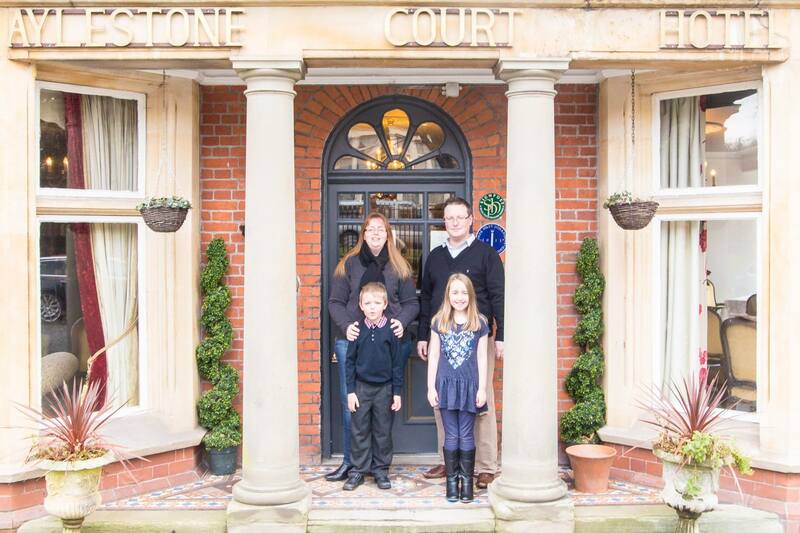 With family values at the heart of our business, we welcome guests into our home and greatly enjoy sharing Aylestone Court with all who visit. Our children, Abigail and Toby, also contribute to the family atmosphere, by helping with small chores and making friends with visitors. Our aim is to create a beautiful home-from-home where guests can retreat and relax in comfort to enjoy our good food and great hospitality. We very much look forward to welcoming you here. Originally a grand family home, Aylestone Court has more recently been used as a dentist surgery as well as a dancing and music school. 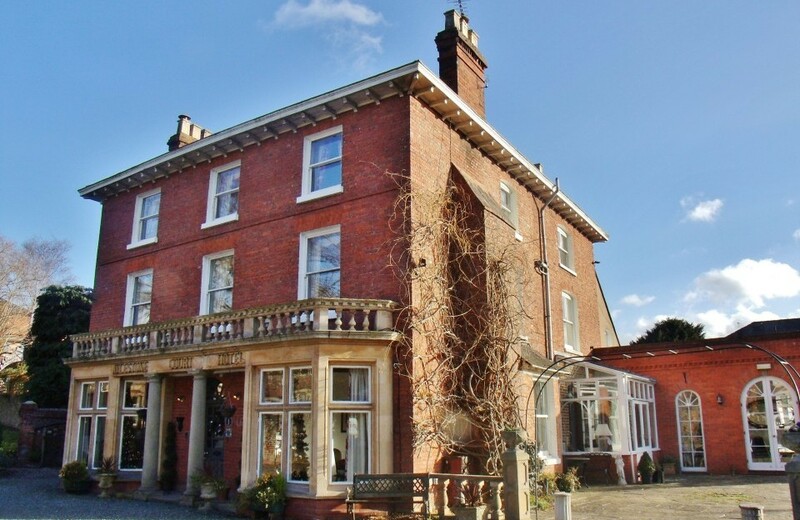 Now Aylestone Court has been lovingly restored to the hotel it is today, offering 6 en suite guest bedrooms, 2 formal dining or function rooms, a licensed bar and guest’s sitting room. The property has retained many original features such as the pretty shuttered windows, marble fireplaces, sparkling chandeliers and some period antiques. It is discreetly elegant throughout while retaining a cosy homely air. The bedrooms are all en suite, some fitted with baths and all with showers, with modern features including TVs with DVDs and free Wi-Fi. Ample off road parking is provided for all guests and Aylestone Court is only a couple of minutes walk from both the train and bus stations. The restaurant offers a daily menu for guests and is always open for external bookings. Afternoon tea is served on family china and is the perfect treat to celebrate a special occasion or catch up with friends. Using locally sourced produce wherever possible, Aylestone Court restaurant serves delicious, flavoursome food, carefully prepared by the resident chefs Michael and Adam, and served in our elegant dining room. 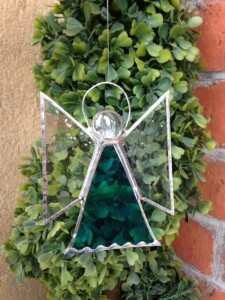 The hotel’s joint owner Jo is a keen stained glass artist and when not working within the hotel itself can be found in her workshop making bespoke pieces of art. Calendar events are often the source of her artistic inspiration and guests who dined at the hotel restaurant for Valentine’s Day were given a stained glass heart on departure. Known throughout the world for its Cathedral, which houses the Mappa Mundi and the chained library, Hereford is a fascinating small city destination for a short break. It is surrounded by stunning scenery with the Wye Valley and Brecon Beacons only a short drive away. The region hosts several annual festivals exploring the rich local culture and heritage particularly food, drink, music and literature. With the re-development of the Old Market which now houses a tempting mix of shops, cafes and the cinema, Hereford cleverly mixes traditional and new, with independent stores sitting comfortably alongside great British high street shops. 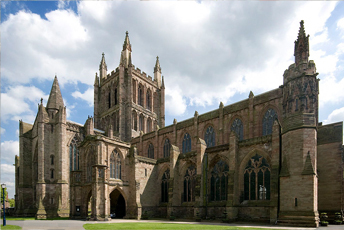 With cobbled side streets leading to the stunning Cathedral green and the statue of Sir Edward Elgar overlooking his musical home, Hereford is simply beautiful.